Amazing Micro-set Ring with a whole mess of diamonds! This might sound weird, but we sell so many diamonds, sometimes I forget we have one. I had this one sitting in our diamond shoebox. The other day when I went to Central Park to dig up the box, I opened it and this stone just kind of popped out. Now, that is a ridiculous story. Who would bury diamonds in Central Park- everyone knows Riverside Park has much better soil. But seriously folks, I did have this diamond sitting in the safe. We had it sent over to show someone looking for a 1.5-2carat intense yellow cushion. They chose a 2 carat- which was amazing- but also $10K more than this guy. Anyway, that was 10/27/05. It's 12/4 today. I know I liked the stone when I first saw it- and looking at it again today, I concur with myself. 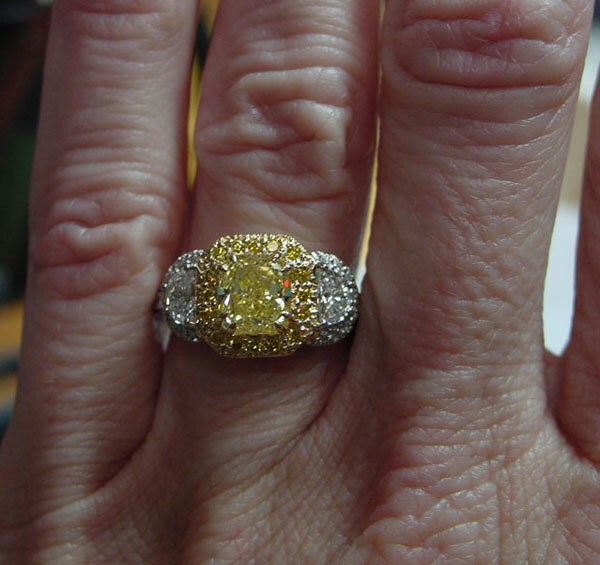 This is one of those "bright yellow" intense yellow diamonds. Very brilliant, yet very yellow- at the same time. It's really a stone for a cushion lover- with all the wonderful attributes of the cut. Below are the stats from the GIA report. 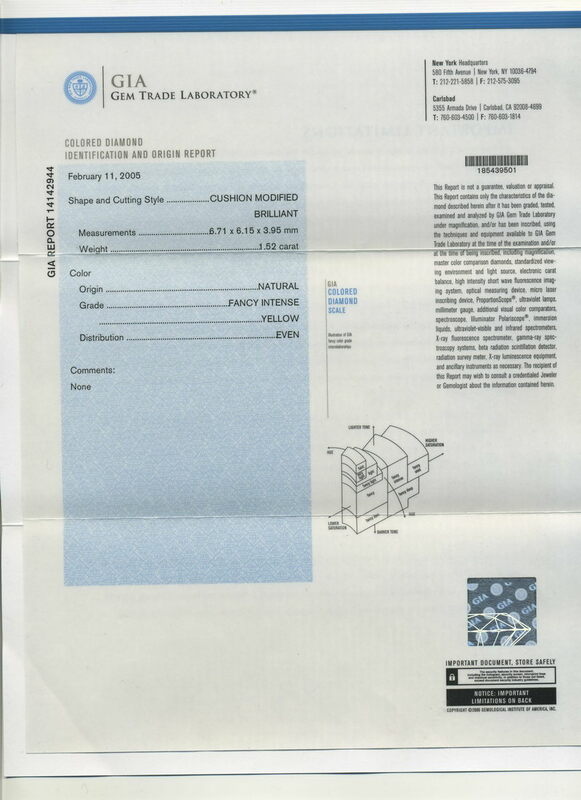 The original laminated GIA report will accompany the diamond. The diamond will be shipped with the original GIA report as well as our comprehensive insurance appraisal. The diamond is set in one of the "fanciest" rings we've ever made. It's a masterpiece- from any angle. There's 17 yellow diamonds set around the center 1.52. Each Half moon has 8 colorless diamonds surrounding it. Then there's 10 diamonds going down each side. That makes a grand total if 56 diamonds set into this ring! Intricate gallery incorporates yellow gold and platinum- immaculate!. Double prongs hold the intense- which is looking quite intense about now. It's kind of difficult to make a case that a $16,000 ring is....inexpensive. On the other hand, it would be quite easy to confuse this with a $50,000 ring. I'm Rock- when my name's on the inside, you can be sure it's a quality piece.